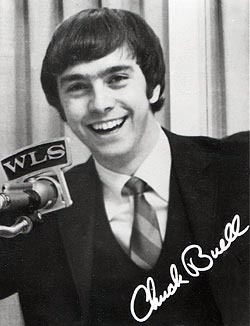 Our thanks to Chuck Buell for this exclusive aircheck of his 8PM hour on WLS/Chicago, from March 19, 1970.
. . . If you're under 18, forget what you just heard . . .
Chuck Buell started his radio career at the age of 12 in 1956 at KRSD in Rapid City, South Dakota. About a dozen years later, he joined 50 Kilowatt WLS, "The Big 89" in Chicago. This aircheck of Chuck from March 19, 1970 comes from what he was able to rescue from his personal collection. He wrote that some of his wrinkly old acetate tapes suffered some water damage, and some got too close to something magnetic. Some were destroyed entirely, and those that survived were re-sampled from 3.75 ips to 7.5 ips before they were digitized a few years ago. This treasure includes John Rook's powerful acapella jingles, Jeffrey Hendrix with news, Lyle Dean with imaging, and a complete ABC Contemporary newscast. After WLS, Chuck moved on to KFRC/San Francisco, KIMN and KRXY in Denver, KHTR and KMOX in St. Louis, KKLT in Phoenix and KBZT in San Diego. Chuck continues to provide voice-overs and narration for business and corporate industrial clients, historical and travel videos, and of course, radio and television commercials. He works and lives just outside of Denver, Colorado, and is on the web at www.chuckbuell.com. 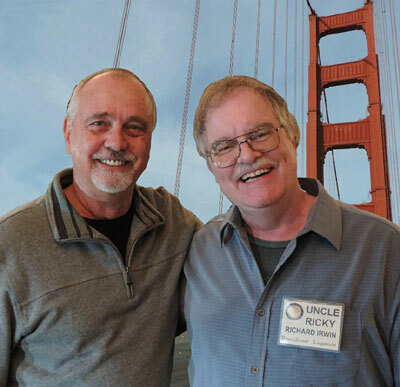 Chuck Buell (Left) and Uncle Ricky were not at the Golden Gate Bridge on November 2, 2013. Nevertheless, Chuck is pretty sure that's where he lost his name tag. After an exhaustive but unsuccessful search of the bridge, Chuck insisted that everyone smile, and suggested that Uncle Ricky change his name to "Uncle Happy". Ricky found this suggestion amusing.